Boys are getting lost, in school and at home. They don’t have a voice. Boys becoming men is an important topic that is not being addressed, and we are seeing the problematic outcome of this. The tragic Santa Fe School Shooting, is one of far too many cases of a young male expressing inner turmoil with outward violence. Boys express deep emotional pain with outward anger resulting in violence. This is but a few of my points during an interview on FOX News at Night with Shannon Bream. 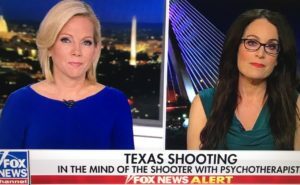 If you missed it on air live on 5/18/18, the link is available for you to view on demand: Sante Fe Shooting – Psychotherapist Commentary. Follow Dr. Karen on Twitter or Facebook. Provides counseling, coaching and consultation in private practice. Media Psychotherapist Guest Expert; Relationships, Parenting, Human Behavior, Analyzes Timely Topics In The News. Appears nationally on FOX News Channel and FOX Business Network (Ingraham Angle, Your World With Neil Cavuto, Coast To Coast, Hannity, FOX News @ Night, Risk & Reward, O'Reilly Factor, Real Story With Gretchen Carlson, America's Newsroom, America's News HQ, FOX & Friends, FOX & Friends FIRST, America Live, Willis Report, John Stossel, and more). Makes frequent appearances on The Dr. Oz Show. Additionally has appeared on: ABC's GMA, Lifetime, Discovery Network, MTV, Steve Harvey TV Show, and more. Local celebrity throughout the New England area, teamed up with NBC Boston's NECN providing a bi-weekly mental health segment. HX: FOX News Boston; Ask Dr. Karen. Sought after Radio Guest Expert. Often quoted in various print media. Keynote Speaker. Author of 3 books: 10 Seconds To Mental Health, Dr. Karen's Marriage Manual, and 9 Key Techniques For Raising Children. Progressive emotional explosion is right. I watched this brief discussion when it aired live. Quite by accident. I happened to be flipping through the channels. You nailed it, though. And in a very compassionate, understanding, and concise manner. Hopefully, your thoughts on it might be absorbed by the casual listener, and particularly other professionals in your field, in some meaningful way, as opposed to simply politicizing the matter for legislative gain alone. I’ve lived with it for over 40 years, untreated. It’s a very lonely way to live.Though, personally, I’d never want to hurt anyone. I’m more prone to a nervous breakdown. When I was listening to you speak on it, I said to myself, there’s a doctor who gets it. Thank you for taking the time to share your thoughts Jimmy and provide positive feedback regarding my perspective. I am glad that you felt like I – get it. I am hopeful this may lead you to consider having a professional to talk to so you do not have to continue to live with what results in a nervous breakdown for you for another 40 years untreated. The first step is recognizing the problem, and you are already there. You are not alone, others are struggling and I too am hopeful that my thoughts will help others. Well. I’m a product of what happens when the State and the courts becomes the solution, Dr. There was a case back in the late 80s where the State come in and took 6 of the 9 children in our home. That was us. I was the oldest. And being the oldest, I witnessed and was victim to a level of mental, emotional, and physical abuse to the extent that few people could never begin to imagine might exist in this world. Running away just landed me in prison for being in the wrong place at the wrong time in the company of the wrong people. As time moved forward, these very real emotional outbursts you acknowledged led me to resort to alcohol. It’stough carrying traumatic baggage around your whole life. Luckily, it didn’t last more than a year. But, in that year, I ended up witth several DUI. And I accept responsibility for it. I went to court for one of them, but the jusge said he didn’t want to hear any excuses. I never went back to the other court hearings. They don’t want to help. They just want to prosecute. Too often PTSD and depression and other mental problems are never heard. People just get punished for them because it’s aburden to the State to address them. And if there is any help, it comes from people who aren’t really qualified. And eventually, they’ll come for me, too. Hopefully after my son graduates college. I want to see that. It’s a small victory for me, but a victory none the less. Anyway. Your absolutelty correct about emotional outbursts. They are absolutely progressive. And those emotional outbursts occur in many forms. In my case it was reaching for alcoho which led to problemsl. But that just messed up my lifeeven more. In cases like that, mental issues just become excuses to a court. And you just sink further into a hole tht just adds to the disease..
All the best, ma’am. And do continue to speak out about progressive emotional outbursts. They’re real.